Willow and Maisie – Your Happy Flower Farmers! 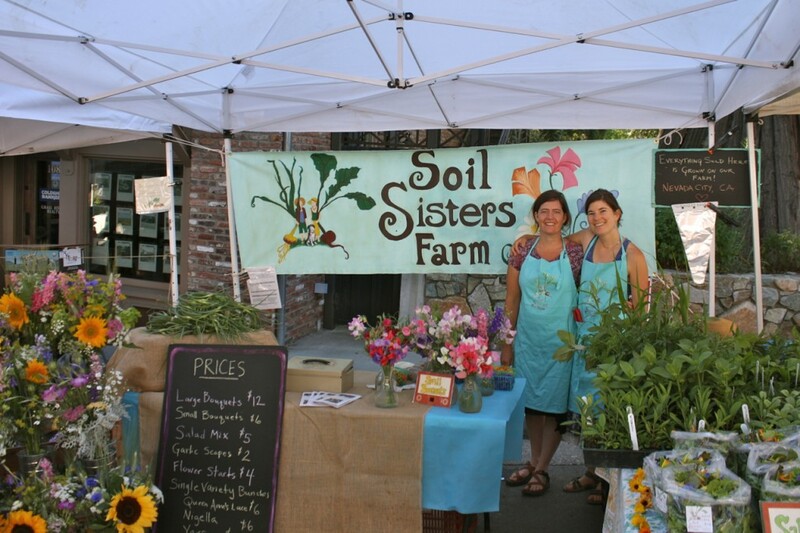 Do you know of someone who’s in need of a little Soil Sisters flower love? A friend who has had a rough year? A family member who needs a little extra love? Someone in our community who loves flowers but doesn’t have the funds this year to have them around? Well maybe a bouquet of flowers every week for twelve weeks this summer would cheer them up! An anonymous donor has offered to purchase a CSA share for someone this 2016 season who is in need. Please respond below with your nominations. Keep in mind that your nominee needs to live in or near Nevada City/Grass Valley and be available on Tuesday evenings to pick up their CSA share. If your nominee can not, then we ask that you commit to picking it up and delivering it yourself. If you prefer your nomination/nominee to be anonymous, please email us at soilsistersfarm@gmail.com with the subject line: Flower CSA Scholarship. Please subscribe to our blog, where we will be announcing the winner Monday, May 2nd, or visit our site on that date. If a prefered anonymous nominee is chosen we will keep said-winner anonymous but at least let everyone know that we have found our recepient! And if you can’t wait a month, consider signing someone you love up for our CSA anyways! We still have spots left and they are going fast. We offer payment plans, email us if you’d like to discuss options. The CSA runs end of June/beginning of July thru September – 12 weeks at $12/week. 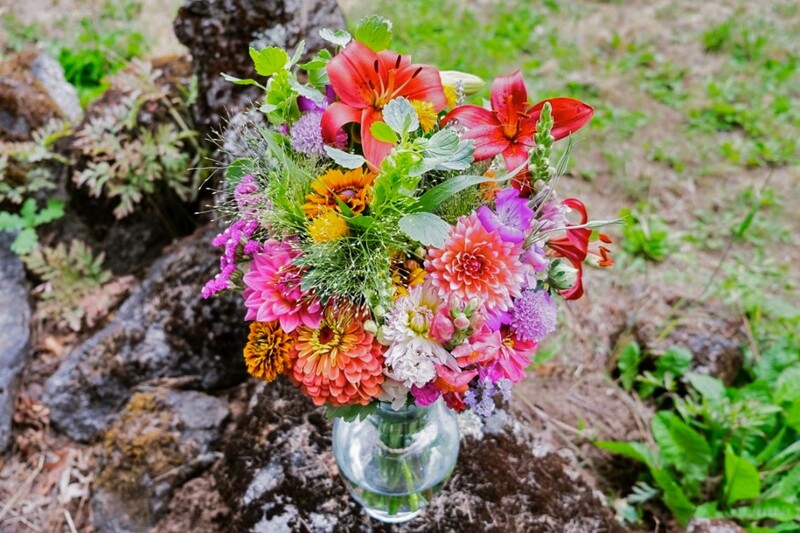 We harvest and arrange our CSA bouquets the same day as our pick up – always conveniently located in downtown Nevada City (exact location to be announced). Thank you and Happy Spring! Hello, I would like to nominate my Mother, Carole Morris. She is a selfless volunteer for several organizations in the area, giving her time, love and strength to distribute and also to care for those in need. She and my Father, David Morris, also cared for me when I had a Multiple Sclerosis relapse all of March. They brought me food, helped me and listened to me, and took me to my appointments. Many, many people have benefited from her love and assistance in this community, and I would love to give her bouquets every week. So beautiful, thank you for sharing and for nominating your mama! Grateful for who they are and that I am their daughter. If you don’t choose Juliette’s mother, which it sounds like maybe you should, I’d like to nominate Nancy Jean Burns, local painter, poet, and flower lover, who works many jobs and lives very simply and I think would appreciate what you grow more than anyone else I know of. Hi gals – I’d like to nominate my mom to receive your wonderful and beautiful flowers. My dad passed away last week after almost 10 years of Alzheimer’s. Linda, my mom, was his caregiver – absolutely selfless and so patient. The love she had for him and his care, I think, allowed my dad to live as long as he did. They did and she will continue to live on an extremely small fixed income. But even with the limited funds, my mom always made sure to keep fresh flowers in the house to raise my dad’s spirits. I would love to have that tradition continue – in honor of my dad and my amazing mom. I would like to nominate Strieker House which is a new day center for the homeless at 606 Gold Flat Rd. NC. We try to have flowers for the day center as they are so enjoyed by many homeless people in our community and our volunteers. Flowers say “we care”. brighten the house the lives of those who do not have much light and give a spirit of nature in the house. We would love to have these flowers each week to share with those who do not have an opportunity to experience this beauty very much. Thank you. Patti, your nomination won! Email us so we can coordinate who will pick up for them each week and what contact info we need. Thanks! I would like to nominate Melinda Booth, director of Wild & Scenic Film Festival. Her tireless efforts towards conservation and activism in the community are amazing. Her team works through the summer to prepare for the film festival and they are constantly giving back to the community.